Different players have been coming to the rescue recently as Elgin Cook had a sensational series against the Washington schools last week, while Tyler Dorsey was the MVP of this weekend as his three pointers and slashing drives to the basket kept the LA schools off-balance. 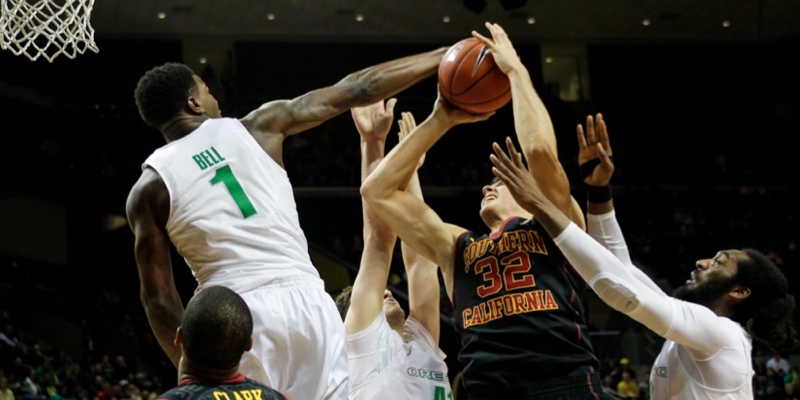 So many times when the Ducks needed a basket badly – it was Dorsey who made a key score. Dwayne Benjamin pulled out of his recent shooting slump and drained a dagger-three with a minute and a half left to dash the Trojans hopes for any comeback and the celebrating began. The emerging offensive game of Jordan Bell has helped balance the Ducks scoring as his spin moves under the basket, and jump hooks have become high-percentage shots the Ducks can count on. It was an amazing season for Oregon, and the short highlight video by the Pac-12 reveals some spectacular plays by our beloved Ducks!